By external standards in women’s clothes departments, my shoulders are a size 14, my waist a size 12 and my hips a size 16. My torso is the same length as someone six foot tall, but my height is five foot four inches. To say that off the peg clothes don’t fit me is an understatement. Tops designed for women pull across my shoulders, gape around my waist and have fallen out with my hips. I have a pile of five inch strips where I’ve had to shorten trousers to sit on my ankles rather than under my feet. I got fed up very quickly about fitting an external idea about what my body should look like. Off the peg clothing feeds into this idea that we should all fit these clothes and look the same with mass production, rather than wear clothes made to fit for our unique and diverse selves. I started shopping in the men’s department and noticed all these differences based on a gender binary. Real and deep pockets vs fake and pointlessly shallow ones. Pastel shades vs dark colours. Fitting that exposes a lot and clings to leave little to the imagination vs silhouettes that make you look big. Stretchy clothes vs solid material. Synthetic vs natural fibres. Short sleeves to irritate the armpit vs sleeves that actually cover the arm. Shoes that compress your toes vs shoes that fit your feet. Floral patterns vs geometric ones. Small animal motifs vs geek culture. A vast array of accessories vs belts and ties. I wondered – is there anything useful about women’s clothing or is it purely cosmetic? Measuring up, a 38 man’s is 38 inches. Fantastically simple. A woman’s 14 is 14 of what? Trousers for men come in waist and inside leg measurements in much greater combinations than the three offered to women – short, medium and long. There was even a waist and leg length combination for me. I brought some men’s novelty boxer shorts and the cashier said, “Your boyfriend will love you for getting him these.” “I’m no-one’s partner,” I replied (saying I don’t have a boyfriend implies that I’m lacking something, when I’m whole on my own). I wondered how many men had encountered a similar conversation when buying women’s underwear. I enjoyed sleeping in my boxers, as they stuck out the bottom of my women’s shorts and were crumpled against my thighs in my clingy women’s trousers. I have found that men’s clothing lasts longer than women’s clothing and it gives the impression that women deserve an inferior product. As an environmentalist, I choose things that last to reduce my waste output, environmental demand (even cotton is produced unsustainably) and social impact (you have more free time if you only have to make something once). Having become a frequent visitor to charity shops (between state income, minimising waste and environmental impact), I’ve discovered the older clothes are, the more durable they are – for both genders. Dresses from the 1940s look better than the cheaply manufactured stuff of today. While prices hover around a certain level, the quality has plummeted. It’s masking a deeper issue of a money system designed to create a cost of living crisis. It’s also pushing people passionate about making clothes out of business in the wake of mass produced garbage. Still, I wanted clothes that reflected who I was and what I needed them to do. So I’m learning how to tailor clothes. I’m very tactile and always put how clothes feel over how they look (unless it’s a long coat, in which case I’m a mirror hog). I’ve pawed many a roll of fabric during talks with stall holders about what’s suitable for my next project. It cultivates passion, local business and skills. I am investing my time into creating something, so I’m very unlikely to throw it away. I am the labour, so I know how the workforce is treated. My current highlight about learning to tailor came when my friend taught me how to take body measurements to make patterns from. Apart from a four inch difference between our respective leg and torso lengths, we were identical. She loved me and hated herself, until the moment she looked at the cold numerical figures in front of us. What difference could four inches between friends make? Her love for me overrode her hatred of herself and her self-esteem grew with the choice to look at herself with love. Love yourself and don’t bother trying to fit a mass produced external idea. 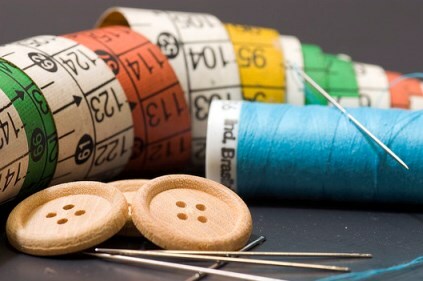 Image is of sewing accessories – a multicoloured inch tape, a reel of blue thread with a sewing needle in it, a few round buttons and a few sewing needles in the front. It was uploaded by Flickr user Rodrigo Campos and has been shared under the Creative Commons Licence. D.T. Dragon, I would like to hug you. This is something I’ve had to grapple with and have had a lot of trouble explaining to people — or maybe no one wants to hear. It’s not so much that “regular” women’s clothes don’t fit me, but that that’s not the kind of clothes I want to wear. That’s pretty simple, though very few people seem to get it, and usually suggest that I’m being unduly difficult. But I’m not a mass produced shape and size, and I actually, really have an idea of *what* I want to wear rather than what current trends dictate what I *should* want to wear. Is that hard to understand? YES, YES AND YES, I don’t know where to start on how much I agree with this post. I find myself gravitating more and more to men’s clothing… not only because I prefer most of the styles, but because as you say, the items tend to be of a far superior quality. But there seems to be a real stigma attached to wearing the ‘wrong genders’ clothes… For example, growing up my niece was into pirates and dinosaurs, there are very few girls clothes with these sorts of things on, so I bought her t-shirts from the boy’s section. My brother went berserk when he found out saying that his little girl and shouldn’t be wearing boys clothes. In terms of cut, there is really no difference at all between a t-shirt for a 5 year old girl and a 5 year old boy, so why did he care so much? When I asked him, he didn’t know, he just didn’t think it was right for girls to wear boys clothes and vice versa. Perhaps I should learn how to make clothes as well – both for mine and my niece’s sake.